Among the Japanese visual arts, Japanese painting is considered as the most highly refined and the oldest. In the vernacular, it is called gado or kaiga. The visual arts in Japan comprises various styles and genres, starting from the traditional to those that were influenced by its close neighbors and the West, mainly from the 16th century onwards. 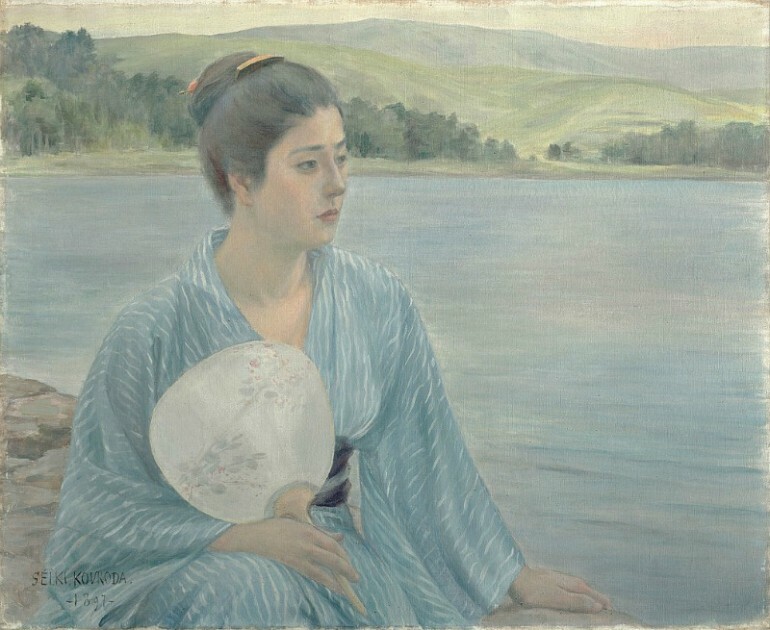 In the same manner, Japanese art, particularly ukiyo-e also influenced the Impressionists in the West, as can be seen from the Orient-inspired works of several artists such as Gustav Klimt, Henri de Toulouse-Lautrec, Edgar Degas, Claude Monet and Vincent van Gogh. Japanese art in the beginning showed Chinese influence, primarily in works like the Buddhist religious paintings, paintings of plants and animals, flowers and birds, calligraphy or ideographs and the ink-wash landscapes that followed the painting tradition of the Chinese literati. However, the subject matter that became the symbol of Japanese painting and printmaking is the depiction of narrative scenes that are heavy in detail and figures and those that depict everyday scenes of people going about their daily lives. 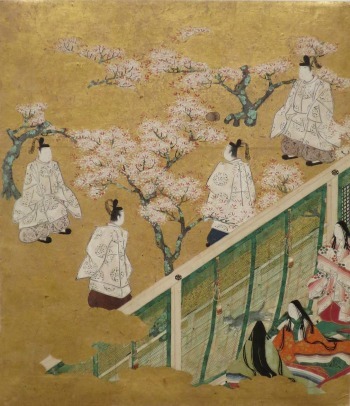 The evolution of Japanese style of painting was wide and varied. They were dictated by the prevailing rulers and traditions of each period. Even during prehistoric times in Japan, art already has its place in the country’s history. The figures were simple, and there were also geometric, architectural and botanical designs. Known examples were the pottery during the Jōmon period and the dōtaku bronze bells of the Yayoi period, from 300 BC until 300 AD. In several tumuli during the Kofun and Asuka periods, from 300 to 700 AD, discovered mural paintings showed figural and geometric designs. During the Asuka period, the Chinese writing system called kanji was introduced, together with Buddhism and Chinese style of government administration. At the same time, art works from China were exported to Japan, with local artists making art works in a similar vein. Nara period was the time when Buddhism got entrenched deeper into Japanese culture. Thus, religious paintings became the norm, with the paintings used to decorate various temples that were commissioned by members of the aristocratic class. It was ironic that Japan during the Nara period was more recognized for sculpture instead of painting. Some of the examples that survived were the murals found on the walls of the Hōryū-ji temple in Ikaruga and the painted images inside the Tamamushi Shrine that were similar to the Chinese painting style during the Sui Dynasty. During the middle of the Nara period, the Tang dynasty painting style was followed. Some of the best examples are the murals in the Takamatsuzuka Tomb. From that style came the Kara-e genre. Kara-e continued to evolve until this period, which was also the time when more religious Buddhist imagery were created. This period witnessed the emergence of the early forms of Yamato-e. This style, likewise called the Japanese-style painting, started to include landscape elements such as rolling hills, while still following the blue and green style of Chinese paintings. Yamato-e reached its peak during the mid-Heian period. Along with it came the development of new formats in painting, such as the emakimono or long hand scrolls with illustrations. Some of them were illustrated novels about historical and religious works such as Genji Monogatari and Ban Dainagon Ekotoba. One of the most popular among the e-maki was the Siege of Sanjō Palace. These styles continued during the Kamakura period. During the Muromachi period (14th century) Zen monasteries developed in Kyoto and Kamakura, which had a great impact in the visual arts in Japan. The monochrome style of ink wash came back to replace the more colorful scroll paintings of the past periods. Typically, the paintings involved quick brush strokes, with fewer details. While the previous art works were done by anonymous artists, several artists came into prominence in the Muromachi period. Some of them were priests and monks, fully supported by the ruling family at that time, the Ashikaga family. It was a complete turnaround during this period as the new art style turned polychrome once again, with silver and gold foil extensively used on large scale work. The Kanō school grew larger as it gained patronage from rulers such as Oda Nobunaga, Toyotomi Hideyoshi and Tokugawa Ieyasu as well as their followers. Palaces and castles of the military nobility became adorned with painted screens and sliding doors as well as wall paintings. The Edo period, which started in 1603 and lasted until 1868 was considered as Azuchi Momoyama period’s continuation. This was the time when the Rinpa school, known for their bold format of painting, characterized with lavish decorations, became prominent. This was the period when Tawaraya Sōtatsu recreated classical literature themes with brightly colored figures and motifs based on natural items juxtaposed against backgrounds decorated with gold leaf. The pre-war period in Japan saw the emergence of differing formats, as Western styles slowly began to come into Japan, which competed with the traditional styles. Japan during the Meiji period underwent massive social and political change, which also affected art. The government promoted yōga or the Western style of painting while there were also groups that wanted to preserve and continue the traditional or Nihonga styles. Among the prominent artists during this period was Kuroda Seiki, who was one of the important leaders of the yōga style.